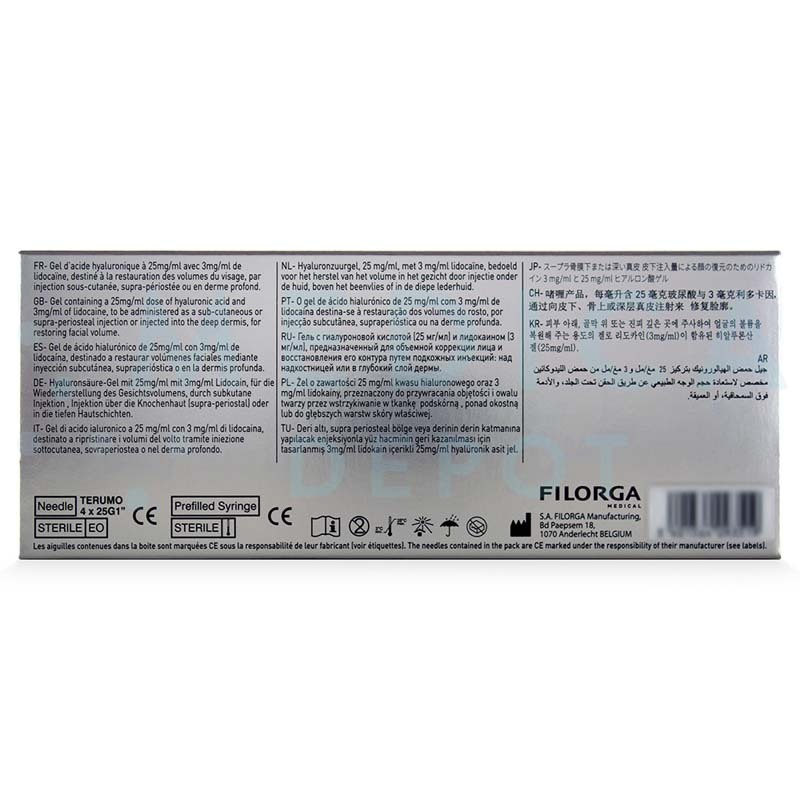 Product Name: FILORGA ART FILLER VOLUME with Lidocaine. Active composition: Hyaluronic acid 25 mg/ml and Lidocaine 3 mg/ml. 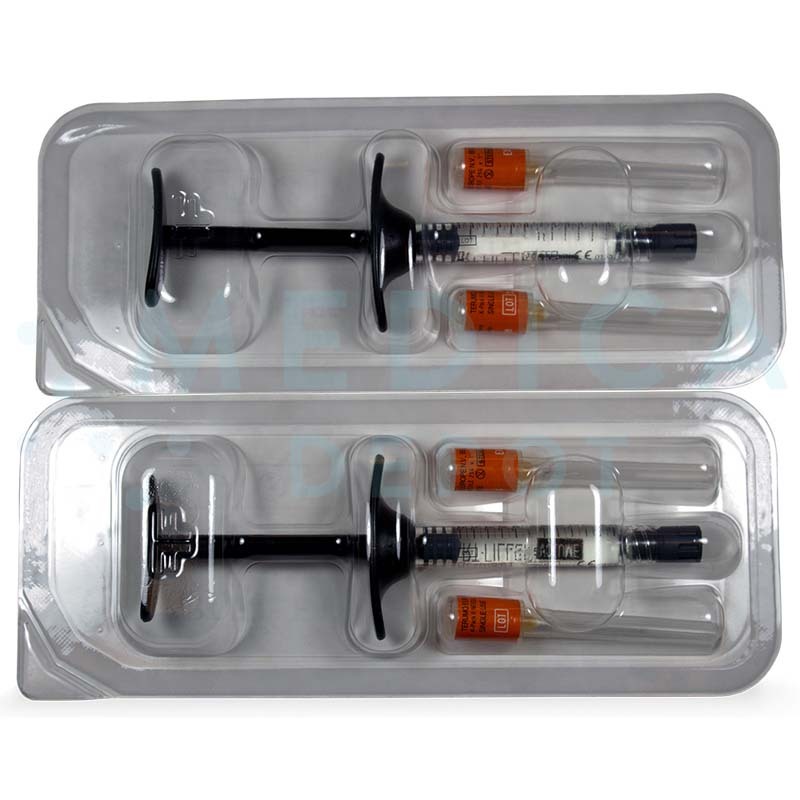 Volume and packaging: Two pre-filled 1.2 ml syringes. Accessory: Four 25G x 1/2” (0.5 x 25 mm) needles, four traceability labels, packaging insert. Storage Conditions: Store between 2° C and 25° C. Keep away from sunlight. 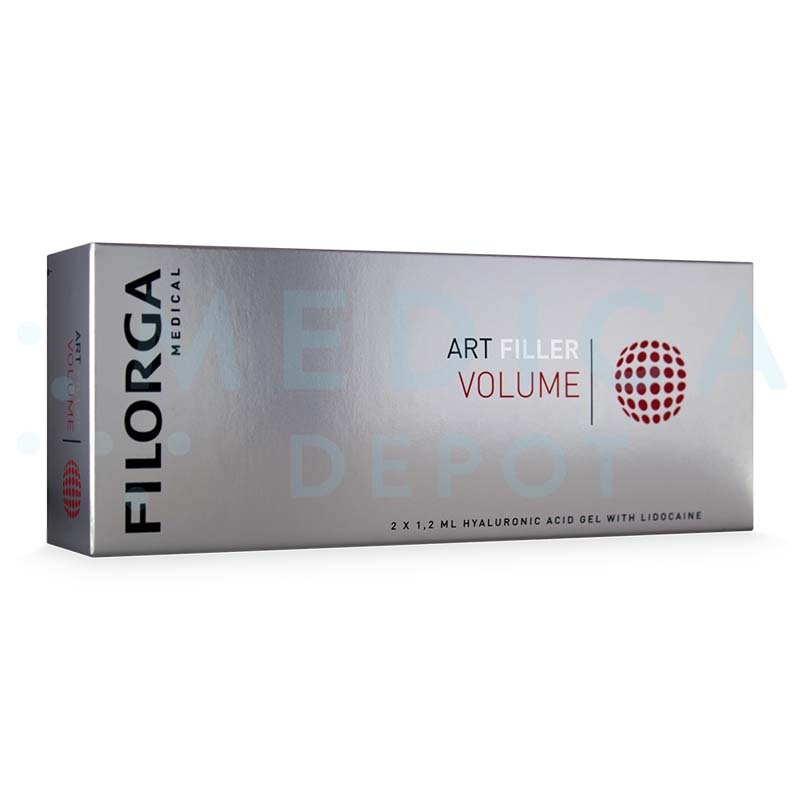 Filorga ART Filler Volume with Lidocaine is an injectable gel for adding or restoring volume to facial features. The hyaluronic acid, made with Tri-hyal technology, holds moisture to add volume, with the ability to sculpt the gel into the correct shape. This dermal filler is suitable for skin affected by volume loss from aging. 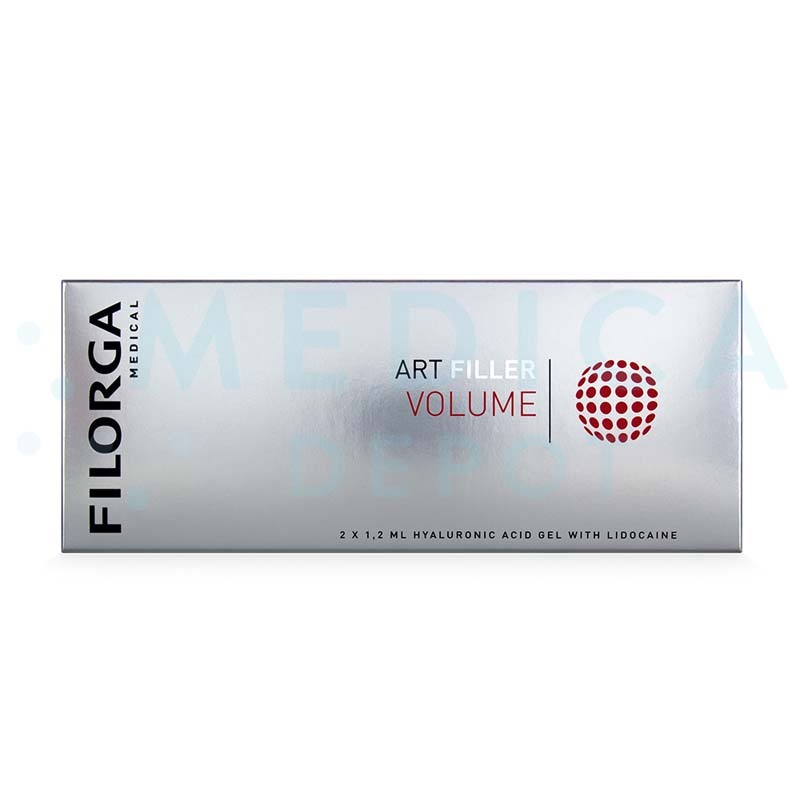 Filorga Art Filler Volume is a cosmetic filler made with hyaluronic acid, with lidocaine anesthetic for pain relief. Doctors inject this filler to restore volume and sculpt facial features affected by age-related volume loss. This was the first hyaluronic acid filler proven to boost collagen and elastin synthesis, helping strengthen skin and improve elasticity for a more youthful texture. You can buy Filorga Art Filler Volume online from Medica Depot. Enjoy the convenience of ordering this and other aesthetic products online while benefiting from low, wholesale prices on 1 to 100 at a time. Buy this and other genuine brand-name dermal fillers online, by phone, or by fax. In 1 package, you will receive 2 prefilled syringes of hyaluronic acid gel, 4-25G1" needles, 4 traceability labels, and 1 product leaflet. Genuine, brand-name dermal filler from Laboratoires Filorga, known for their skincare products. Contains lidocaine to improve treatment comfort. Highly-moldable gel can be sculpted after injection, integrating into tissue for natural-looking results. Lasts up to 18 months after an initial treatment and 1 touch-up treatment. How does Filorga Art Filler Volume work? This injectable gel is made of hyaluronic acid, produced with Tri-Hyal technology. The resulting gel is highly moldable, integrating well with dermal tissue for natural-looking results. When you inject the hyaluronic acid into your patient's skin, the particles hold moisture, restoring volume and hydration to aging tissue. This volume helps support the skin, restoring a fuller, more youthful shape to facial features. In addition to its ability to hydrate and add volume, hyaluronic acid can also stimulate collagen growth, strengthening, and rejuvenating aging skin. The other ingredient in this filler, lidocaine, acts as an anesthetic during treatment, reducing needle pain. What are the ingredients in Filorga Art Filler Volume? This cosmetic filler contains cross-linked hyaluronic acid plus lidocaine for needle pain. What is the difference between this and other Filorga products? This is the Art filler with the highest filing ability, making it most suitable for restoring volume. The Filorga NCTF mesotherapy products, in contrast, do not have a high volume-restoring ability, but do have extra ingredients, such as vitamins, minerals, amino acids, coenzymes, nucleic acid bases, and antioxidants, to rejuvenate skin. The Art fillers do not have these extra ingredients. Administer this hyaluronic acid gel using a subcutaneous, supraperiostal, or deep dermal injection, using a 25G needle, following proper aseptic techniques. Do not overcorrect. After injection, gently massage the treated area to ensure the gel molds into the correct shape and integrates with the dermal tissues. When should I use this cosmetic injectable? Use this filler to enhance facial contours and to restore lost volume. The results of a treatment can last about 18 months after 1 touch-up treatment after 9 months. What areas of the body can I treat with this cosmetic filler? You can use this aesthetic injectable on the cheeks or other areas of the face affected by age-related volume loss. Who is an ideal candidate for Filorga Art Filler Volume treatments? The ideal candidate for these treatments is a patient who is experiencing noticeable signs of aging, with loss of volume and sagging in their cheeks and other facial areas. The injections can help restore facial volume lost to the natural aging process. Why should I purchase Filorga Art Filler Volume? Purchase this cosmetic filler to help your patients restore facial volume and shape lost as they age. Art Filler Volume is made by Laboratoires Filorga, a popular French skincare brand with products in the U.S. and around the world, so you and your patients know you can count on this filler to provide quality results. The inclusion of lidocaine in the filler gel helps reduce needle pain during treatment while saving you the time and hassle of applying or mixing in your own anesthetic. Not only that, the ergonomic finger grip on the syringe makes the treatments more comfortable for you. Most of all, by purchasing Filorga Art Filler Volume from Medica Depot, you save money with low wholesale prices. What are Filorga Art Filler Volume's side effects? Rarely, immediate or delayed hypersensitivity. Side effects usually resolve within a week. These may not be all the possible side effects.